With official news of the Souverän M800 Burnt Orange finally coming out of Hannover, it seemed that all of Pelikan’s planned releases for 2015 had finally been announced. When Goldspot Pens posted their Pelikan Fall Preview 2015 two weeks ago that notion was cast into doubt. The very last paragraph of that post was cryptically titled “More Pelikan?” Goldspot’s post indicated that an old favorite within the M200 series was going to make a come-back with a debut anticipated for November 2015 but the author would not reveal any more. There have been roughly thirty M200 releases since the series’ introduction in 1985 so which of these could be the old favorite alluded to in Goldspot’s blog? 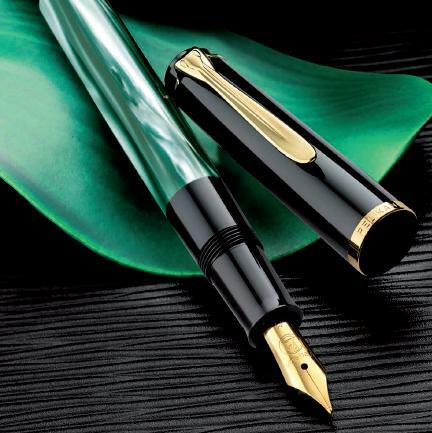 It now appears that the “old favorite” is none other than the M200 Green Marbled, a pen previously reported to be one of Pelikan’s best sellers. Sound like deja vu? It should as this is not the first time this pen has resurfaced. Back around 2010, Pelikan was unable to source the raw materials required to produce the M200 Green Marbled series of pens. The pen became unavailable on the market and was backordered by vendors for over a year. In October of 2011, they were re-introduced and again made available to consumers. It is unclear for just how long they remained before being discontinued. Now, according to reliable information, the M200 green marbled will be relaunched at the end of 2015 with a new material comprising the barrel. This new element is a high-quality acrylic that is reported to have great depth and shine that serves to give the pen an attractive appearance while still keeping true to the look of the original release. I suspect the reason for the new components likely has to do with the difficulty Pelikan previously had sourcing the raw materials to produce this model. This fountain pen is to be part of the standard collection and will be accompanied by a ballpoint pen (K200) as well as a pencil (D200). Of course, the pen will be equipped with the gold-plated furniture and stainless steel nib that is characteristic of the Classic series. No word yet on pricing so stay tuned for further developments. What are your thoughts on this re-introduction? The marbled variants have been around since almost the beginning of the line. These are commonly found in both the old and new-style M200 configurations as well as, less commonly, a run of M250’s made for the Japanese market. While the silver pearls has always been my favorite, I have enjoyed both the blue and green marbled variants. Perhaps I’d be more excited to see the silver pearls re-emerge since that is the scarcest of the lot but I’m sure this green marbled version will do well for itself. What a great news. I have the M200 Clear and the M200 Cognac, but I really wanted the “classic one”. I hope the come back is for good. Thanks for the good news. This is a beautiful pen, and indeed a classic. I do wish they’d bring back the blue as well. I would be excited to see that as well. We’ve seen a lot of neat new pens from Pelikan this year. Who knows what 2016 might bring? Hi! I bought one in November. The seller told me that it was the new version. How do I know it’s the new version and not the previous one? Is there any clue? Hello Gabi. Pelikan is essentially trying to keep the look near identical from what I understand. I have heard that one of the problems with the prior release was that the material was hard to source which led to a shortage. The new material is more easily sourced. I believe it has a bit deeper luster when compared with the original release. That’s really the biggest difference. Wouldn’t really be able to distinguish between them without the two side by side but I have not seen the new version in person for myself. I have one coming later this week and will be eager to compare. I’ll be doing a post in January comparing all of the versions of the M2xx Green Marbled released to date (5 variations believe it or not).